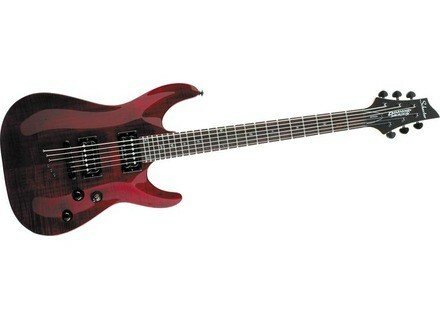 Gryphon, STC-Shaped Guitar from Schecter. This guitar was the second guitar I ever owned, and I bought it back in 2005 or 2006. Let me start by saying I play a pretty wide range of music. I had a pretty big metal phase where I would have my guitar in anything from standard tuning to drop B, I play clean, a little jazz, blues, classic rock, modern rock, you name it - it can do it all. This guitar has a great clean sound, can take heavy distortion with ease, can be twangy when you want it to be, and can be full and powerful when you need it to be. The neck is one of my favorites I've ever played. The maple is very smooth, PERFECTLY shaped, and you can reach the 24th fret with ease (plus a nice rosewood fret board). I just bought an ESP/LTD MH-400 which is beautiful and cost about 3 times as much as this, and even though it's amazing, if I had to only play one of the two going forward I would choose the Shecter Gryphon. Overall, for the value this is one of the best guitars on the market. Priced for anyone, and a pro would enjoy playing it. Whether you're a beginner looking to get a great guitar to last you years to come, or you're more experienced looking for a versatile utility guitar that won't break the bank, I highly suggest this product.